The Union men faced a formidable task. Butterfield's division had to cross 600 yards (550 m) of open pasture land owned by widow Lucinda Dogan, the final 150 yards (140 m) of which were steeply uphill, to attack a strong position behind the unfinished railroad; Hatch's division had only 300 yards (270 m) to traverse, but was required to perform a complex right wheel maneuver under fire to hit the Confederate position squarely in its front. They experienced devastating fire from Stephen Lee's batteries and then withering volleys from the infantrymen in the line. Nevertheless, they were able to break the Confederate line, routing the 48th Virginia Infantry. The Stonewall Brigade rushed in to restore the line, taking heavy casualties, including its commander, Col. Baylor. In what was arguably the most famous incident of the battle, Confederates in Col. Bradley T. Johnson's and Col. Leroy A. Stafford's brigades fired so much that they ran out of ammunition and resorted to throwing large rocks at the 24th New York, causing occasional damage, and prompting some of the surprised New Yorkers to throw them back. To support Jackson's exhausted defense, Longstreet's artillery added to the barrage against Union reinforcements attempting to move in, cutting them to pieces. The Union defenders south of the turnpike consisted of only two brigades, commanded by Cols. Nathaniel C. McLean (Schenck's division, Sigel's I Corps) and Gouverneur K. Warren (Sykes's division, Porter's V Corps). McLean held Chinn Ridge, Warren was near Groveton, about 800 yards (730 m) further west. Hood's men began the assault at 4 p.m., immediately overwhelming Warren's two regiments, the 5th New York (Duryée's Zouaves) and 10th New York (the National Zouaves). Within the first 10 minutes of contact, the 500 men of the 5th New York lost almost 300 shot, 120 of them mortally wounded. This was the largest loss of life of any infantry regiment in a single battle during the entire war. As Pope and McDowell realized the danger of their situation, they ordered units to occupy Henry House Hill, but until that could occur, McLean's brigade was the only obstacle to the Confederate onslaught. His 1,200 Ohioans in four regiments lined up, facing west on Chinn Ridge, with one artillery battery in support, and were able to repulse two assaults, first by Hood and then by Shanks Evans's brigade (Kemper's division). The third assault, by Col. Montgomery D. Corse's brigade (also Kemper's division), was successful. McLean's men mistakenly believed the men approaching the southern tip of the ridge were friendly and withheld their fire. When they realized their mistake, a fierce firefight ensued for over 10 minutes at virtually point-blank range, but added fire from a Louisiana artillery battery caused the Union line to collapse. 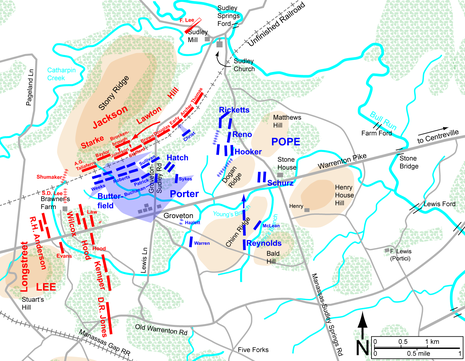 The Ohio brigade suffered 33% casualties, but they gave Pope an additional 30 minutes to bring up reinforcements. The first two Union brigades to arrive were from Rickett's division, commanded by Brig. Gen. Zealous B. Tower and Col. Robert Stiles. Tower's brigade was overwhelmed by attacks from three sides. His artillery battery was captured and he was seriously wounded. Stiles's brigade, following Tower, fell victim to two newly arrived brigades from Kemper's division, commanded by Brig. Gen. Micah Jenkins and Col. Eppa Hunton. During this intense fighting, the commander of the 12th Massachusetts, Col. Fletcher Webster (son of the statesman Daniel Webster), was mortally wounded. Two more Union brigades poured into the battle from Sigel's I Corps, commanded by Cols. John Koltes and Włodzimierz Krzyżanowski, but had no more success than their predecessors. The lead elements of Jones's division, the brigades of Cols. George T. Anderson and Henry L. Benning, swept all Union resistance off Chinn Ridge by 6 p.m. However, the successful Confederate assault came at a high cost, both in men (Hood's and Kemper's divisions suffered heavy losses and were at least temporarily incapable of further offensive action) and in time. Henry House Hill was still several hundred yards away and there was only an hour of daylight remaining. "R.H. Anderson failed to avail himself of the most significant advantage three hours of fighting on Chinn Ridge and Henry Hill had forged. Because he did not, the Confederates' last opportunity to destroy Pope's army dwindled with the day's light." 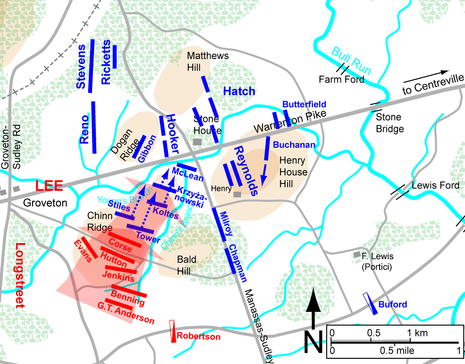 August 30, 5 p.m.: Final Confederate attacks, beginning of the Union retreat. Union casualties were about 10,000 killed and wounded out of 62,000 engaged; the Confederates lost about 1,300 killed and 7,000 wounded out of 50,000.As the Union Army concentrated on Centreville, Lee planned his next move. He sent Jackson on another flanking march in an attempt to interpose his army between Pope and Washington. Pope countered the move and the two forces clashed a final time at the Battle of Chantilly (also known as Ox Hill) on September 1. Lee immediately began his next campaign on September 3, when the vanguard of the Army of Northern Virginia crossed the Potomac River, marching toward a fateful encounter with the Army of the Potomac in the Maryland Campaign and the Battle of Antietam. "A splendid army almost demoralized, millions of public property given up or destroyed, thousands of lives of our best men sacrificed for no purpose. I dare not trust myself to speak of this commander [Pope] as I feel and believe. Suffice to say ... that more insolence, superciliousness, ignorance, and pretentiousness were never combined in one man. It can in truth be said of him that he had not a friend in his command from the smallest drummer boy to the highest general officer." On August 30, 1862, the Second Battle of Manassas ended a long campaign in northern Virginia. The campaign had begun when Union forces attempting to invade the Southern capital at Richmond were defeated just miles from the city. After the defeat near Richmond, the scattered Union forces under Major General John Pope clashed repeatedly with the Southern troops under Major General "Stonewall" Jackson. At the August 9 Battle of Cedar Mountain, Jackson's Confederates outnumbered the Union troops two-to-one. After his easy victory there, Jackson retired from the field as Union reinforcements arrived. While Pope's Union army was engaged in fighting against General Robert E. Lee's forces along the Rappahannock River, Jackson attempted to maneuver around to Pope's rear in order to cut off his supply lines. 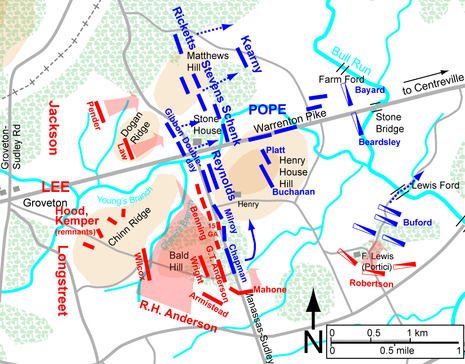 Weary from inconclusive fighting along the Rappahannock, Pope decided to concentrate his forces and march on Jackson, who had succeeded in cutting off Pope's supplies. A race was on for Pope to find and destroy Jackson before Lee could march his men to Jackson's aid. During the Union occupation of Northern Virginia, many slaves took the opportunity to escape. This 1862 photograph, taken by Timothy O'Sullivan, shows a group of fugitive slaves fording the Rappahannock River on their way North. 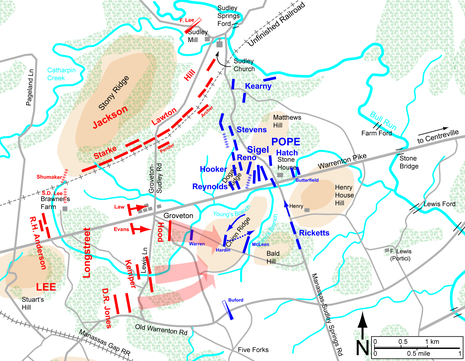 The Second Battle of Manassas began on August 28, when Pope marched his men right into Jackson's waiting forces near the town of Manassas. Jackson had set up his defenses at the site of the First Battle of Manassas which had ended in Confederate victory just one year earlier. After some rough skirmishes, darkness fell, and both sides retired for the night. Throughout the day of August 29, fighting raged up and down the line without a decisive victory. Pope's Northerners broke through the Confederate defenses several times but were always pushed back. Throughout that night, Confederate movement to the west convinced Pope that the Southerners were preparing to retreat. On the morning of August 30, Pope attacked the Confederates to the west, hoping to destroy the escaping Southern troops. Instead, he found 30,000 newly-arrived reinforcements under General Robert E. Lee. The day was spent in fierce fighting; in the end, the Northerners were forced to retreat to nearby Centreville and, eventually, to the safety of Washington, D.C. The Library of Congress holds over forty of Walt Whitman's notebooks. Whitman used the notebooks to record his thoughts and observations in prose and in poetry. During the Civil War, Whitman carried small notebooks with him on visits to wounded soldiers in hospitals. He jotted down stories that the soldiers told and took note of treats or supplies which he could bring to the men on return visits.